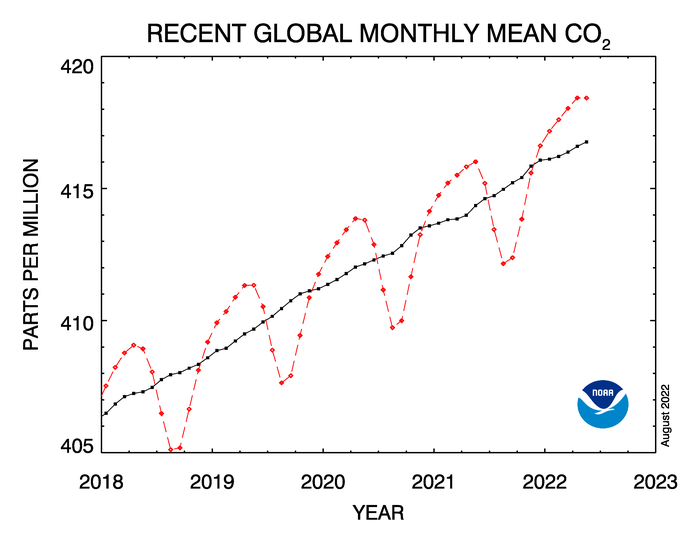 Figure 1: Recent CO2 levels in the atmosphere (Source: NOAA/ESRL). Atmospheric levels of carbon dioxide increase year after year (Figure 1) and so does global temperature. The amount of carbon dioxide and other greenhouse gases such as water vapor, methane, nitrous oxide and fluorinated gases in the atmosphere cause the greenhouse effect that carries the main responsibility for climate change. Along with increasing temperatures come melting ice sheets, rising sea-levels, changes in precipitation patterns, and increased risks of extreme events such as floods, droughts, heat waves, storms and wildfires. Human activities such as deforestation, livestock farming, and the burning of fossil fuels contribute much to climate change. IPCC estimates that deforestation causes about 20% of global carbon dioxide emissions, which is more than the emissions from the whole world’s transportation sector (cars, trucks, and air-planes combined). For in-depth information, read the IPCC report 2007. The Greenhouse effect is a natural process where greenhouse gases in the atmosphere contain solar energy inside the atmosphere. With this effect the average temperature on earth would be -18oC. Human endeavor has induced an increased greenhouse effect and caused climate change. Figure 2: Temperature deviation from normal, 2015, since 1951-1980. Orange color represent temperatures that are warmer than the 1951-80 baseline average, and blue represent temperatures cooler than the baseline. Note the blue area south of Greenland due to melting ice. (Source: NASA/NOAA 2016). Scientists consider the safe level of atmospheric carbon dioxide to be 350 ppm (parts per million), and it may be less. The present carbon dioxide amount is already at 403.9 ppm (March 2016, Figure 1) and is rising by about 2-3 ppm per year. The planet’s average surface temperature has risen with about 1.0 degree Celsius since the late 1800s. Most of the warming has occurred in the past three decades (35 years), with 15 of the 16 warmest years on record occurring since 2001. 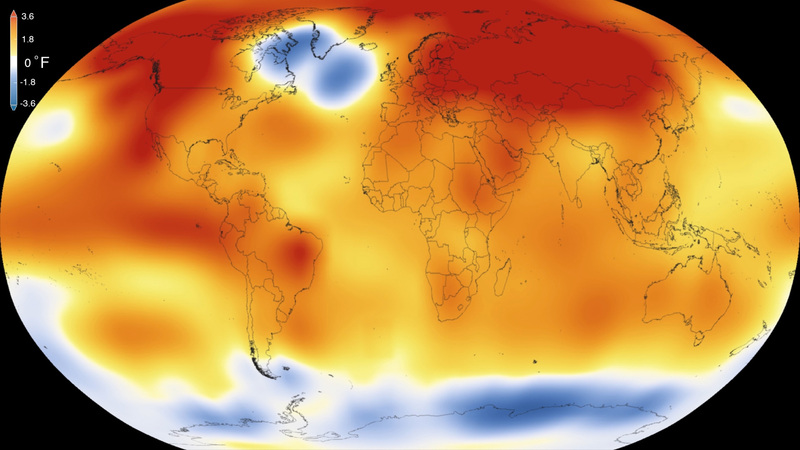 2015 was the warmest year since 1880 (Figure 2). A temperature rise of 2-6.4°C is predicted by 2100. To avoid a global disaster, the goal is to keep global warming less than 2 degrees Celsius but the recent Paris treaty stated that the target should rather be 1.5°C. In other words, we immediately need to make significant progress in reducing energy consumption, as well as halting deforestation, forest degradation, and associated emissions of greenhouse gases. A study in the scientific journal Nature 2009 (Rockström et al.) tried to identify the Earth-system processes and thresholds which, if crossed, could cause dangerous and possibly catastrophic changes in the global environment. Three of them are already considered to be exceeded: rate of biodiversity loss, climate change and human interference with the nitrogen cycle. Read more in the article on ecosystem boundaries.